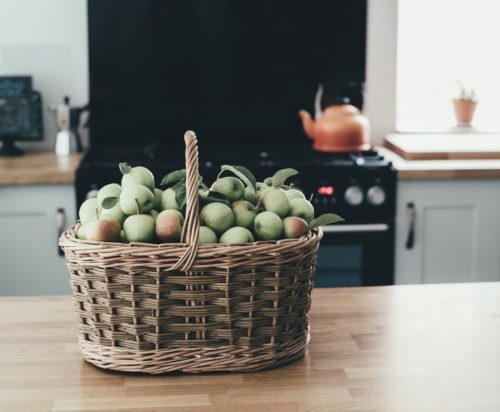 Fall decor ideas include my favorite seasonal ways to decorate, especially when you consider the longevity of this season. 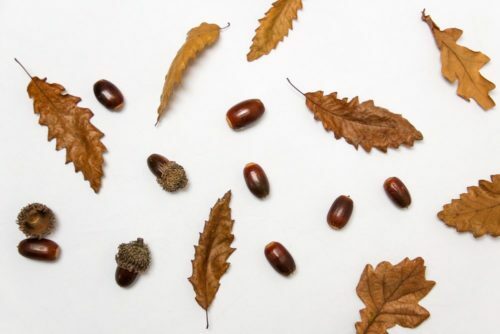 Fall decor extends from September to November, much longer than the Christmas or Easter season or any of the other decor-worthy holidays. 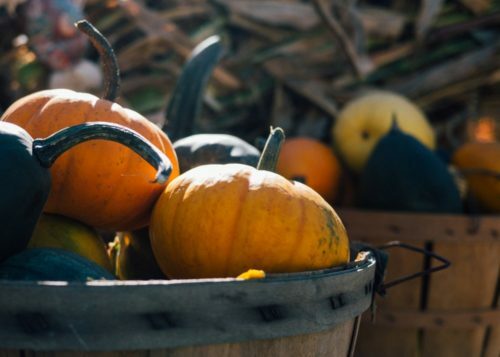 Nature-inspired decor such as leaves or pumpkins don’t scream “Hallowe’en” and are just as appropriate come Thanksgiving. 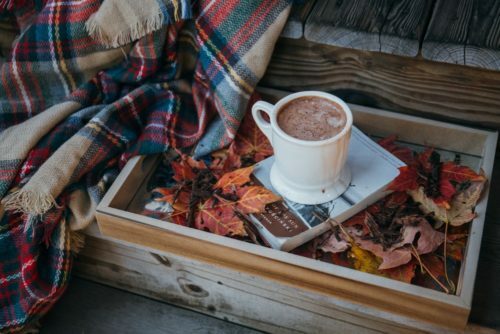 Some of my favorite fall decor ideas below. I love nothing more than going into my backyard and clipping branches, dried hydrangeas or leaves, and making a fall, floral arrangement. It’s also the perfect excuse to trim a few low-lying branches to tidy up the yard. 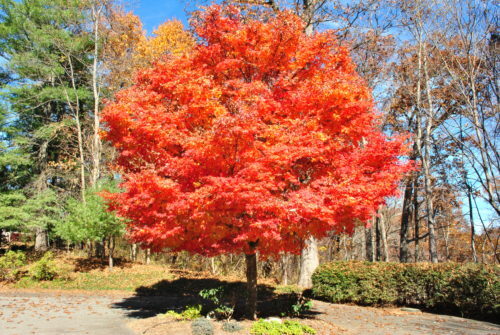 A few years ago, I had a spectacular arrangement from branches of the tree pictured below. 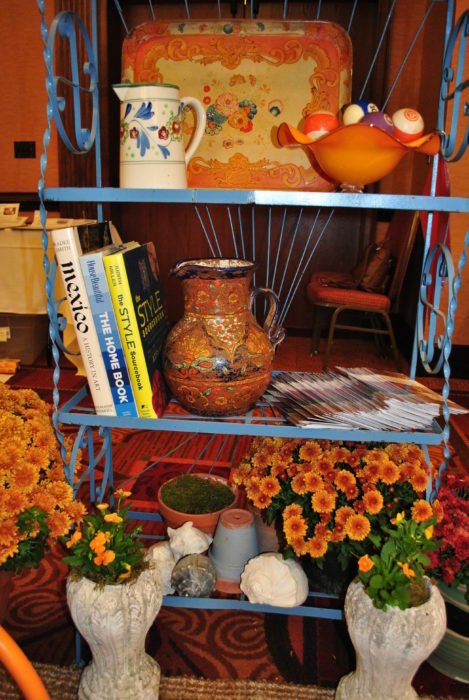 And I love this arrangement below that I did for a trade show that not only incorporated the colors of fall but also my fondness for Spanish colors. Nothing says fall quite like a display of apples or small gourds. I especially love the lady apple, small and delicate, and not so overtly autumnal in color. 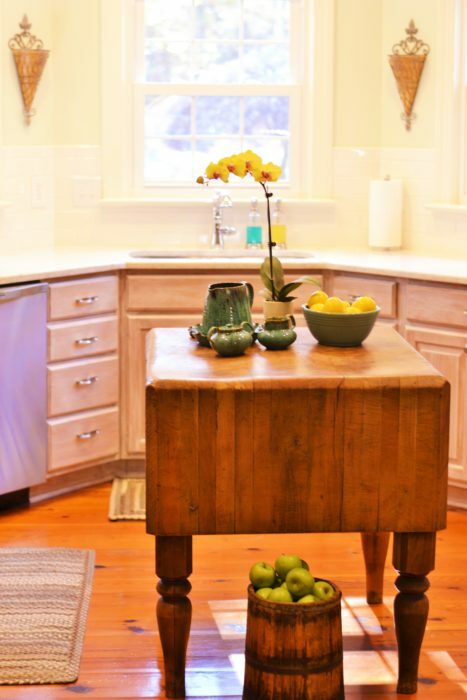 It is inviting and homey, and perhaps implies some baked or carmelized apples are in your lucky guest’s future. Makes me want to go apple-picking, our erstwhile annual tradition with the kiddos. 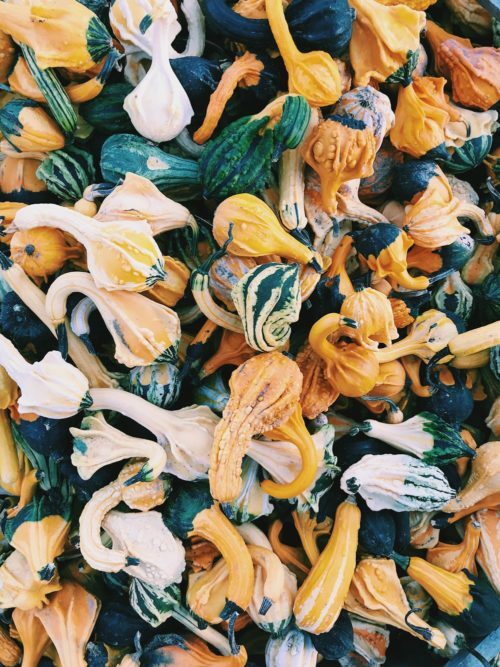 Mini gourds are lovely, en masse, in a bowl or scattered across a mantel or a couple displayed on an entry hall table to welcome the season and your guests. 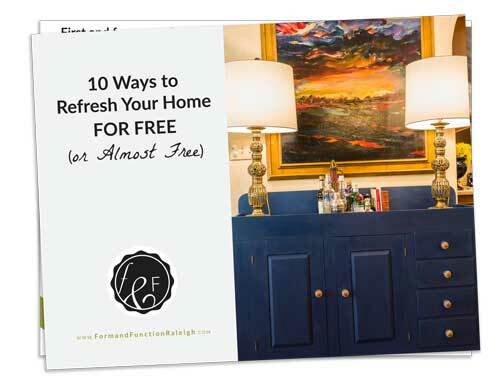 A change to more heavy-weight linens and throws in seasonal colors is a wonderful way to inject some fall decor. Who doesn’t love a plaid blanket? It reminds me of stadiums and football games and fall picnics with a thermos of cocoa or perhaps a flask of something stronger! 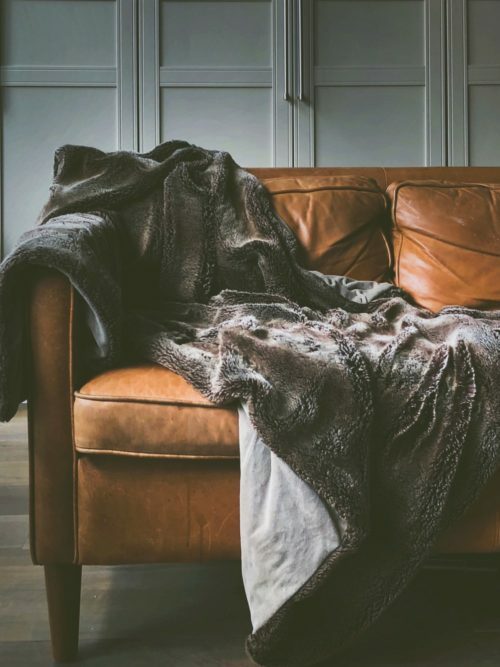 If plaid is not your thing or you prefer a more neutral fall palette, try throws with texture or weight that indicate a change of seasons. Think furry, cozy comfort like the one pictured below. Mums say fall to me like no other flower. When the kids were little and I had zero time on my hands, I would pick up some pots of mums for my front steps and a few pumpkins and call it a day. Easy peasy fall decor ideas. I used mums (at the same tradeshow mentioned above) to inject color in vintage pots. 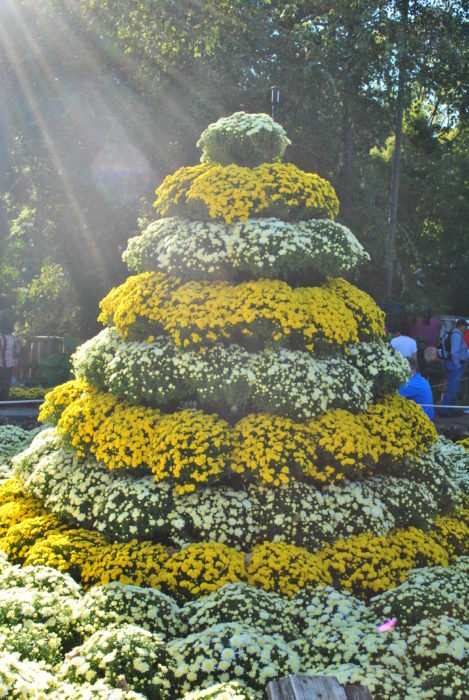 And look at this more elaborate “Christmas Tree” effect for mums that I captured at the state fair years ago. Wouldn’t that be fun to emulate on a smaller scale? 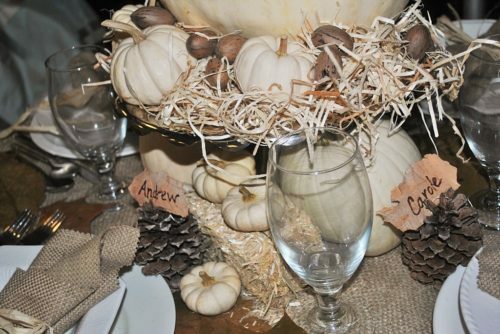 Tablescaping fall decor ideas can vary from the formal to more rustic. 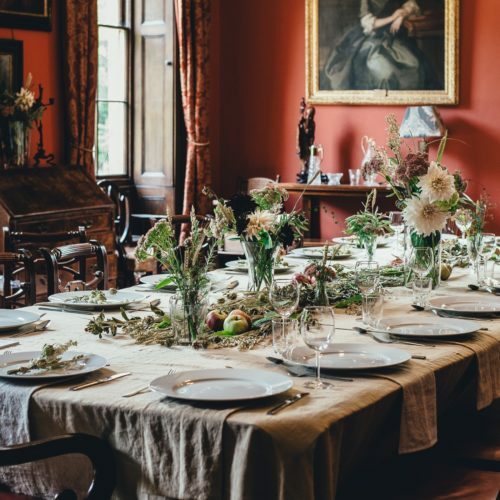 This is a great opportunity to shake things up from your usual tablecloths and floral centerpieces. I love the one below as it is more natural and relaxed but still very elegant. 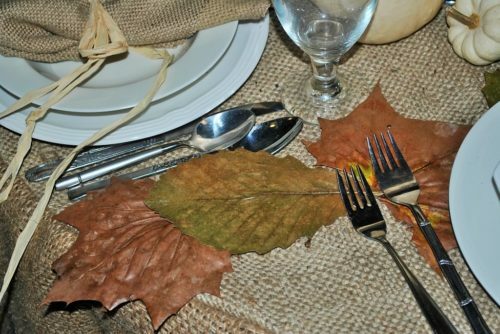 I competed in a tablescape competition years ago and went for a rustic fall feel with neutral colors. Everything was either found, vintage, or made from upcycled materials. First, my seamstress created a tablecloth from old coffee sacks I provided for her. Then I layered pressed leaves over top and used a hollowed out white pumpkin as a “vase” and smaller pumpkins layered about. The dishes, glasses and silverware were all mismatched and found at Goodwill. Finally, the placecards were fashioned from birch bark from my yard and placed in pinecones. 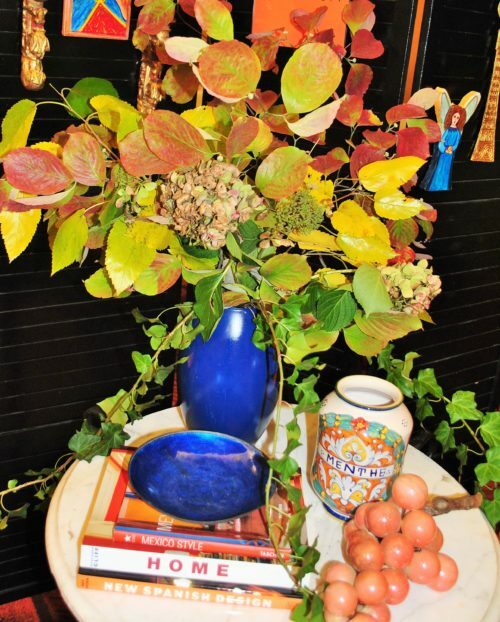 Some other great fall decor ideas here and here.